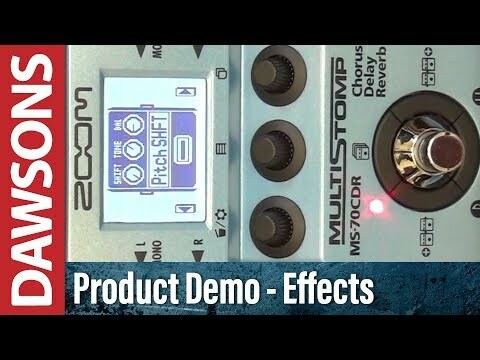 The Zoom MS70CDR is a effects pedal built for both guitarists and bassists. Small and compact, this multistomp saves room on your pedalboard and is portable enough to bring from one gig to the next. With plenty of diverse effects to choose from, this pedal has everything you need in one, single stompbox. This single pedal provides a total of 86 different effects for use with guitar or bass. Zoom split up the effects into categories to facilitate use of the pedal. The effects' sections are Chorus, Delay and Reverb, and these open up a world of sound. Encompassing anything from the classic to the modern, this pedal is a true performer. Offering 26 mono and stereo delays, 31 chorus and modulation effects, this pedal can single-handedly emulate various other effects pedals and modelers. Zoom have also fitted the MS70CDR with a leading DSP microchip for studio-quality effects as well as 25 simulations that expand your sound. There are two different graphic equalisers, one for the guitar and the other for bass guitar. The pedal is designed with the Zoom Noise Reduction algorithm to prevent any unwanted sounds. Zoom have worked hard on making the MS70CDR an easy-to-use pedal for use in either the recording studio or onstage. Stereo input jacks allow you to use the pedal either with active or passive instruments, or even with electronic keyboards and effects processors. It also features dual line-level output jacks so you can record multiple sounds and effects in stereo. The MS70CDR enables you to use 6 different effects at the same time and in any chosen order. The pedal also features 50 patch memories, perfect for storing your custom-made effects, and improved by 30 pre-loaded effects with factory settings. You don't have to worry about losing anything you have made thanks to the Auto Save function, which can keep up to 26 patches. By pressing down on the footswitch you can run through these patches, an ideal feature for a live musician. Furthermore, the backlit LCD screen allows the user to see the settings easily in a dark venue. Zoom have added in an onboard chromatic tuner which helps you to retune your guitar or bass in a wide range of standard or drop tunings. The Tap Tempo feature makes it easy to set delay or modulation rates in real time. To power the MS70CDR you only need two AA batteries (either alkaline or rechargeable NiMH). As soon as you plug in your guitar or bass to the input jack, the pedal comes on automatically. When the pedal is not in use for some time, the Power Management function kicks in, switching the pedal off to save the battery. When using AA batteries to power the pedal, it can last up to 7 hours, which is plenty of playing time to practise and perform. There are also options to power up using an AC adapter or USB port. The Zoom MS70CDR Multistomp Chorus / Delay / Reverb pedal has a lot to offer in a very compact package, and also comes with a handy user manual. Posted on 18/08/2017 by moogbadger This pedal is fab. It might not sound quite as good as the dedicated effects it's trying to model, but it's not far off in some cases, and it's very versatile. Up to six effects on one patch. It'll do far more than just 'chorus/delay/reverb' - it's got an almost-identical emulation of the Line 6 Particle Reverb in it, and it'll do passable pitch-shift and Univibe sounds too. For Just £90 it's great value for money, and useful to have around to pair up with more expensive effects too. Posted on 20/07/2017 by The Badger Zoom seem to have trouble shaking off their (perhaps unfair) reputation for being 'jack of all trades, master of none', perhaps due to their wacky 1990s inventions (such as the strap-on mini multieffects such as the Zoom 9002 (see here: https://planetbotch.blogspot.co.uk/2014/09/the-zoom-9002-guitar-multi-fx-processor.html).